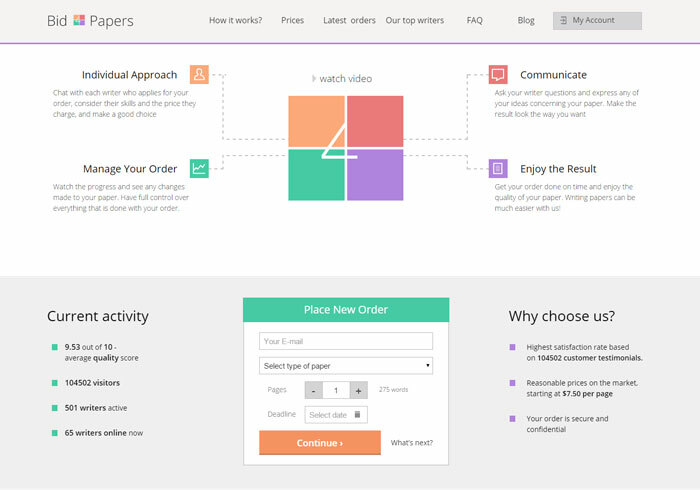 Bid4papers.com is another way of offering custom academic writing services to students. It is based on the principle of minimal interference of the service in the cooperation of customer and writer. Basically, you place your order, you choose the writer, and you decide when to pay him or her. However, the minimal interference is closely connected with the minimal guarantees. Let us check from the very beginning. You can see the list of top writers on the website, and even from the names it is clear, that they are not native speakers. Nevertheless, they are holding a lot of awards designed by the service’s so-called quality control. The company claims that all their writers are at least Bachelors, which may make students worry, since other services offer assistance from at least Master’s degree holders. The writers (especially the top ones) deal with the full range of subjects, starting from Literature and up to Chemistry. This makes one understand that the writer has just the superficial knowledge of these subjects and cannot conduct a deep analysis on a particular academic issue. It is important to check the feedback from customers who hire writers of this company. In the “recent orders” tab we saw a comment saying “all answers are wrong” and that is about one of the top writers. This significantly decreases the desire to order with this company. You cannot know how much to pay and this is always a surprise for you. The pricing page shows nothing but the example of the price calculation. The final cost of your paper depends on the bids of writers, so you can forget about stable pricing here. There are no discounts. It seems that you use the service completely at your own risk. Once you have paid to your writer, no refunds are possible. Moreover, the company threatens you that if you submit the paper delivered fully or partly, they may stop working with you. There is nothing specified about revisions, so do not expect to get any. There is no possibility to communicate with support in real time, you can just leave a request and it will be in a queue for review. Thus, your urgent orders may be left without attention. We have placed an order, and it took time for us to get the writer for it and learn the price. The total was quite average – we have paid $20 for a High School History paper to be completed within a week. The writer asked a lot of questions, what made us feel like we were paying for the assignment on ourselves. In a week we got a paper, and it was written like by a middle school student: the grammar and word choice clearly indicated the style of ESL writer with poor knowledge on the topic. If you are not a risky person, who is able to do things despite all the warnings and failures, stay away from this service and choose the one that guarantees the real result of your purchase.